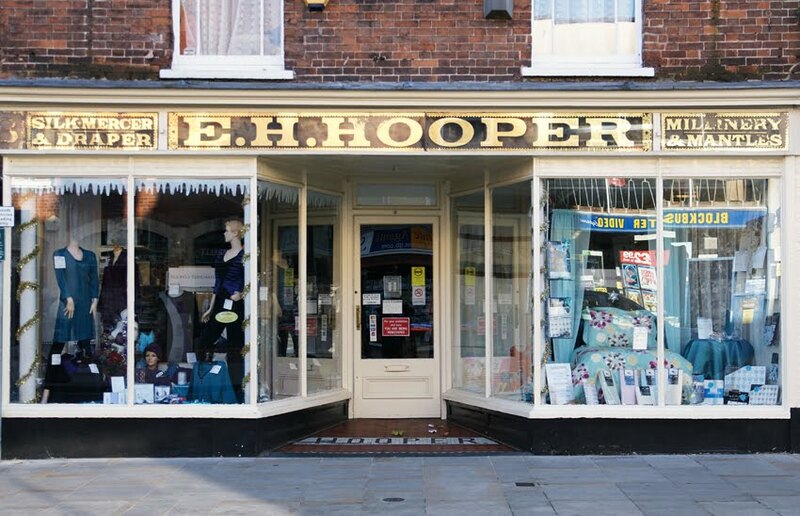 One of the finest buildings in Bridgwater's shopping streets, E H Hooper is a beautiful Victorian survival. While it may offer less in the way of silk mercery, mantles and millinery than in years past, it continues to sell ladies' clothing and household linen. 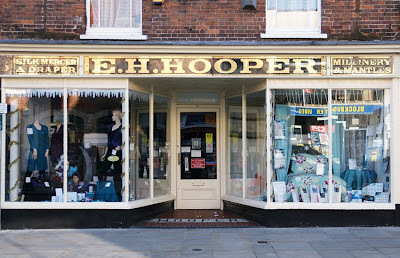 Built as a house in the eighteenth century, the building was later converted to commercial use and its shop-front dates from late nineteenth century. There are so many lovely details: from the age-worn wording of the sign to the mosaic in the doorway. It's just a shame that the plate glass windows now reflect some rather mundane shopfronts from the other side of the street. Having been built in 1367, the spire of St Mary's, Bridgwater has required repairs from time to time in the centuries since. Those of 1694 are commemorated in a plaque - but it's rather cryptic. 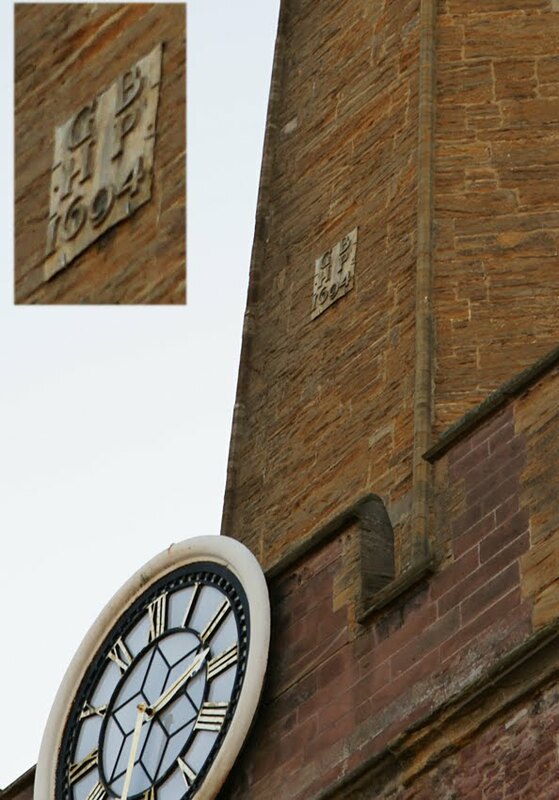 First, it's on the side of the spire itself so reading it from the ground requires excellent eyesight. Second, the text is very economical: 'G B/H P/1694'. This type of inscription always intrigues me. Were those responsible too modest to add more (although too proud to resist altogether)? Were they arrogant enough to think that everyone would always know just what those few letters and numbers meant? Or were they simply limited by space and money? The Royal Society of Chemistry has got a lot of publicity for its 'toast sandwich' recipe, inspired by Mrs Beeton and apparently costing 7.5 pence (which surely depends upon cheap bread and cheaper electricity). However, in emphasising its simplicity, the RSC are failing to heed Mrs Beeton's stern and substantial advice on the subject of toast. To make dry toast properly, a great deal of attention is required; much more, indeed, than people generally suppose. Never use new bread for making any kind of toast, as it eats heavy, and, besides, is very extravagant. Procure a loaf of household bread about two days old; cut off as many slices as may be required, not quite 1/4 inch in thickness; trim off the crusts and ragged edges, put the bread on a toasting fork, and hold it before a very clear fire. Move it backwards and forwards until the bread is nicely coloured; then turn it and toast the other side, and do not place it so near the fire that it blackens. Dry toast should be more gradually made than buttered toast, as its great beauty consists in its crispness, and this cannot be attained unless the process is slow and the bread is allowed gradually to colour. It should never be made long before it is wanted, as it soon becomes tough, unless placed on the fender in front of the fire. As soon as each piece is ready, it should be put into a rack, or stood upon its edges, and sent quickly to table. 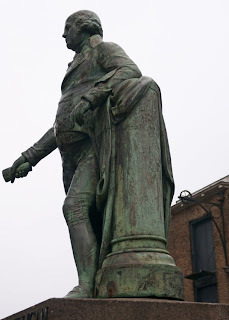 Last year, I blogged about a statue commemorating Dr Salter, who provided healthcare to Bermondsey's poor as well as working for them as the local MP. Sadly, that statue has been stolen from its bench; the girl and cat have been moved for safekeeping. 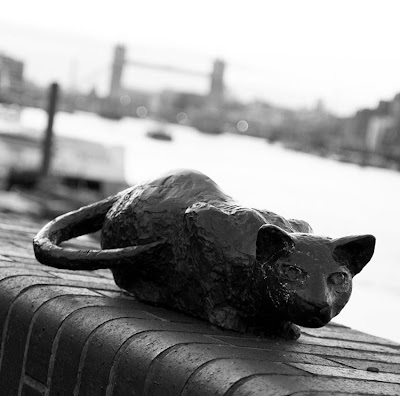 On the Thames path at Bermondsey, a man sits on a bench waving at a small girl and a large cat. They may make an odd trio but they do tell a story, as a nearby board explains. The man is Dr Alfred Salter, born in Greenwich in 1873. A doctor trained at Guy's Hospital, he first visited and then moved to Bermondsey and took practical action to address the poverty there. Not only did he provide consultations for sixpence (or even free), but he also set up a health insurance scheme and Sunday morning adult education classes. Through his efforts, the area had a local health service long before the establishment of the NHS. He also became a local Liberal councillor before moving to the Independent Labour Party. Dr Salter married and had a daughter, who was educated locally. However, she died of scarlet fever aged only 8: this is the girl depicted in his daydream. After her death, his work for local people continued. He bought a house in Kent which was turned into a convalescent home for Bermondsey people, and in 1922 became MP for Bermondsey. The returning officer who declared him elected was the mayor - his wife Ada, a successful activist in her own right and the first woman mayor in London and first Labour mayor in Britain. He served as MP until 1945, when he stood down on health grounds. Dr Salter died later that year. 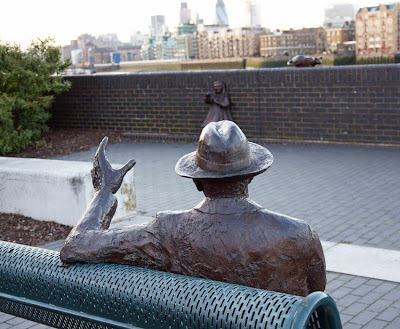 If you know anything about the statue's whereabouts, Southwark Council are offering a £1,000 reward. 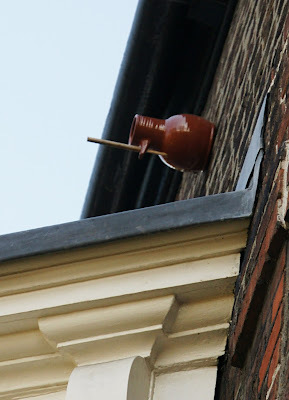 The mystery object on the front of Hogarth's House is a bird pot or 'sparrow pot'. These ceramic, bottle-shaped objects were designed for birds to nest in and seem to have been popular throughout London in the eighteenth century (and for several centuries before). However, their exact purpose is uncertain. A similar pot has been found in Williamsburg, USA; you can buy a replica from the Colonial Williamsburg catalogue, which assumes that the birds were welcomed in order to control insects. However, that doesn't seem to be quite such a convincing explanation for urban London. Why, then, were city-dwellers eager to attract small birds to nest outside their windows? The likeliest explanation seems to be that the eggs and baby birds were readily accessible (by reaching out of a window and unhooking the bottle) so that they could be taken and eaten. This rather grisly explanation does raise a question: were the tiny amounts of protein worth the effort? I also thought that birds would soon learn not to nest in these 'bottles' if they wanted their young to survive, but apparently they are more likely to respond by laying another clutch of eggs. 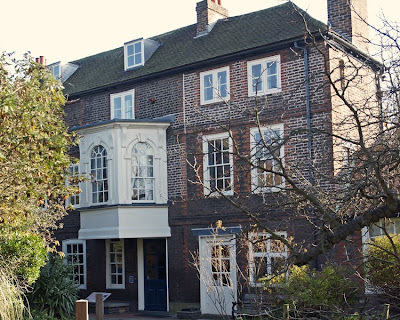 It will be interesting to find out how the bird pot on Hogarth's House fares. I should add that the staff have no plans to eat any birds nesting there! 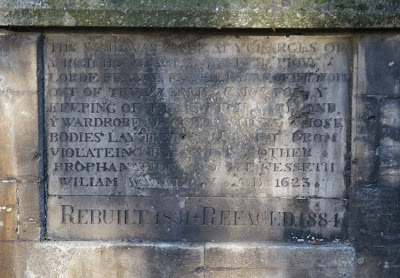 This wall was made at ye charges of ye right honourable and trulie pious Lorde Francis Russell Earle of Bedford oute of true zeale and care for ye keeping of this churchyard and ye wardrobe of Goddes saintes, whose bodies lay therein buryed from violating of swine and other profanation so witnesseth William Walker, v.1623’ Rebuilt in 1831: refaced in 1884. Nearby is a flood marker, which doesn't look that remarkable until the passer-by notices the considerable slope from the river's edge to this point in the road. 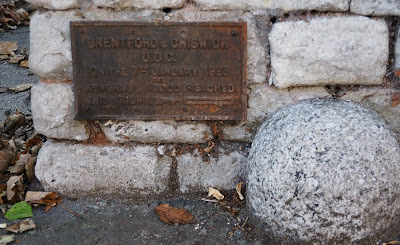 The date is also a hint that this flooding was out of the ordinary: it marks the high point of the lethal 1928 floods which affected much of riverside London. How better to explore the life of eighteenth-century artist William Hogarth than on a sunny autumn day in Chiswick, in the company of London Historians? Famous as the creator of Gin Lane and The Rake's Progress, Hogarth was an artist, satirist and cartoonist who depicted all levels of London life. 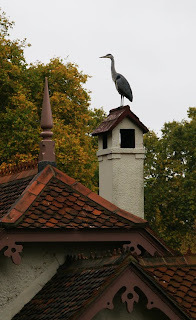 However, he also had a country home - in Chiswick, then a rural area on the edge of the city. His home was a relatively modest house which he extended and embellished with an oriel window. It has survived largely intact, despite the efforts of a World War II bomb, and has just reopened after several years' restoration. While the house is now alongside the A4, it was easy to ignore the sound of traffic as our guide Val Bott took us back to the quiet village Hogarth knew. 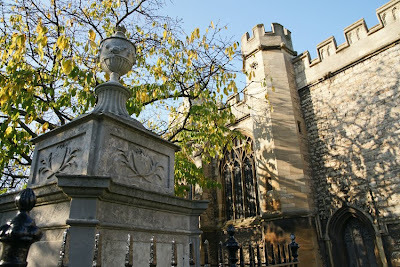 It was also in Chiswick that Hogarth was buried, in the churchyard of St Nicholas's. 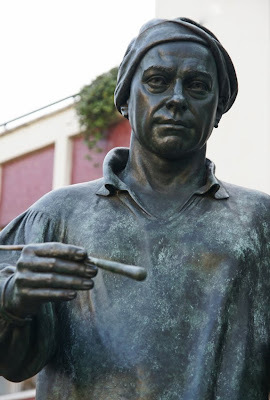 Here, his friend the actor David Garrick was involved in erecting a memorial to him. Hogarth is also remembered by a statue on the High Road and, rather incongruously, a roundabout. Unfortunately, when many London motorists hear his name they probably think first of the traffic news! We'll leave Chiswick with a little mystery: can you identify this object, which is on the facade of Hogarth's house? 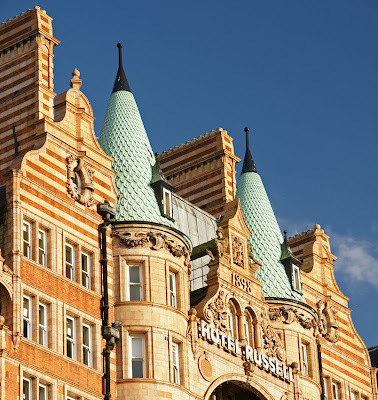 The Hotel Russell in Bloomsbury is an elaborate late-Victorian structure, full of carved details and decorative flourishes. No excuse is missed for a bit of sculpture or a few reliefs. Perhaps most fanciful of all is the roofline: there are stripy chimneys, turrets worthy of a Disney castle, and of course a few more garlands and warriors. Charles Fitzroy Doll was the architect responsible for all this exuberance. Although he designed a number of hotels, his most famous (and short-lived) creation is perhaps the Titanic's dining room. While that work is now at the bottom of the ocean, the Hotel Russell's fate is much happier: recently restored, it continues to dominate its square. Last night was the official relaunch of the new, improved London Remembers. This amazing website maps an enormous number of London memorials of all kinds, and is now lovelier and easier to use than ever. If you want to find out about a particular memorial then there's a very good chance you'll find it here. However, the true joy of the site is just browsing through all the extraordinary lives commemorated in fountains, statues, plaques and more. It's a labour of love, which means that the definition can be stretched now and then to include a not-quite memorial to a shop and some puzzling stones commemorating 'Little Whig and Kitt Catt'. There are many, many more treasures: get browsing and choose your own favourites! Looking out at West India Docks, Robert Milligan's statue has seen a lot of changes since 1813. However, they are no more extreme than the changes Milligan had overseen here during his lifetime. Born and brought up in Jamaica, where his family owned sugar plantations, Milligan came to London in 1779. Here, he would become the leading member of a group of businessmen who created the West India Docks. They wanted a safer place to unload cargoes from the Caribbean, which had suffered heavy thefts elsewhere in London's port. The foundation stone was laid in 1800, with the dock itself opening just two years later. After a move to the dock entrance and a period in storage, Milligan's statue is back in its original position. However, behind him the former warehouses are now the Museum of London Docklands which tells the story not only of the docks he lived among and expanded, but also of the slavery and exploitation which lay behind the wealth of Milligan and his colleagues. 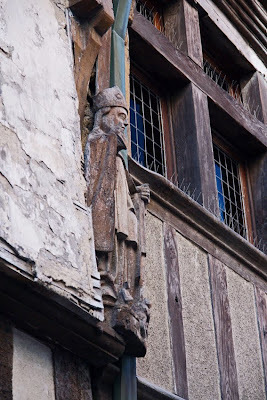 The mediaeval town of Dinan, Brittany is full of wonderful details. This carved figure adds its own contribution to the varied textures of wood on a half-timbered facade. There is a whole lost world of London entertainment: its pleasure grounds, panoramas and private museums. One eighteenth-century attraction which now survives only as a street name was John Castle’s shell grotto, a wonderland of constructions in shells, housed in an acre of the open land which then characterised Marylebone. The grotto didn’t long survive Castle’s death in 1757, and in the nineteenth century the area was no longer one of fields. 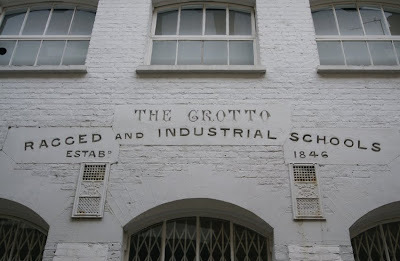 Instead, a ragged and industrial school was built in Grotto Passage– but its elaborate lettering perhaps suggests a hint of whimsy lingering about the spot. 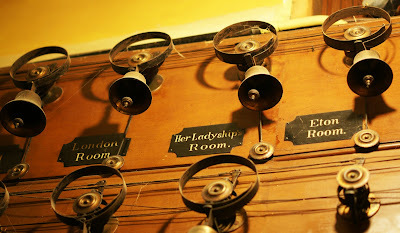 This institution was opened in 1846, in a small room in the above locality, at first as an evening school for boys of the ragged class. 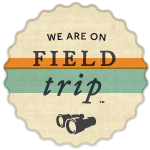 In 1849 a refuge and reformatory for boys was opened, accommodation having been made for 25. 209 have been admitted; of these, 62 have been sent to Australia; 34 to Canada; 55 have entered the royal navy; 36 the merchant service; and 10 various kinds of service at home. Total, 197. I discovered this intriguing alley on a tour of Marylebone with Jo of Westminster Walking which I’d recommend highly. Alternatively, if all this talk of grottos has put you in a festive mood, she offers a tour of London’s Christmas lights which ends in a pub with a fire and mulled wine. 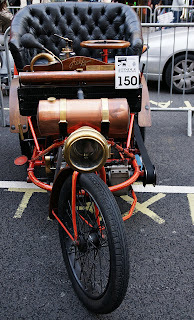 Sadly, I missed the display of vehicles from this year's London to Brighton Veteran Car Run. However, here's a look back at my visit to this fabulous event in 2009. It may be stood on a taxi rank, but this is not a new design for London taxis! Rather, this is one of a surprisingly large number of very elderly cars making the journey from London to Brighton today - yesterday, there was chance to enjoy seeing them parked along Regent Street. All pre-1905, they were commemorating a special event in British motoring history: the Emancipation Run which celebrated the passing of the Locomotives on the Highway Act 1896. Before the Act was passed, cars were restricted by a speed limit of 4mph and - even more restrictively - the need to be preceded by a man walking with a red flag. The law had been targeted at steam traction engines, but a test case in 1895 had confirmed that cars were treated as locomotives rather than (horseless) carriages. A campaign for reform met with reasonably prompt success, and vehicles under three tons were exempted from the restrictions. Now, they could speed across the country at a racy 14mph. How better to celebrate than with a trip to the seaside? The original London to Brighton run is recreated annually, preceded by the Saturday show. A mixture of Regent Street shoppers and vintage car enthusiasts crowded around these fascinating vehicles. Given the number of people, it made sense to photograph details rather than 'portraits' of the cars. I particularly like the diversity of designs - the steering wheel, for example, had not yet become standard - and the features clearly borrowed from the horse-drawn carriages these cars would eventually replace. The stars of St James's Park are the pelicans: a feature since 1664 when some were presented to Charles II by the Russian Ambassador. One of the city's more unusual experiences is watching the pelican feeding, which happens each day at 2.30pm. The waterfowl here are natives of almost every climate in the world, and the Zoological Society itself has scarcely a finer or more varied collection. Those which are not foreign are mostly descendants of the ducks which Charles II. took such pleasure in feeding with his own royal hands. ... It is almost needless to add that the banks of the "canal," and the bridge which spans it, are the haunt of children and their nurses, and the pieces of bread and biscuit which are given daily to the ducks, geese, and swans would well-nigh feed the inmates of a workhouse. 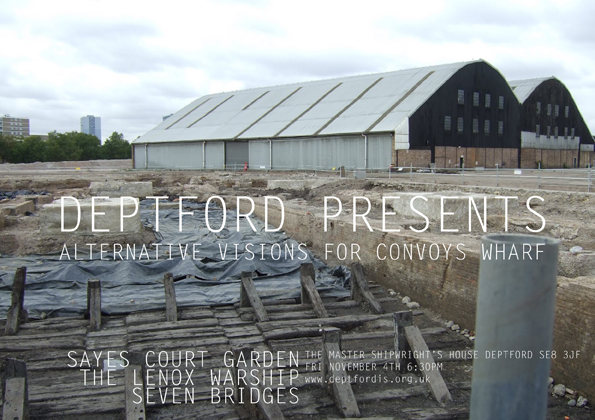 If you are near Deptford this evening or tomorrow morning, there is an opportunity to see alternative visions for Convoy's Wharf - the former naval dockyard, full of historic interest and about to be redeveloped. This (Friday) evening's event is from 6.30pm with a presentation at 7pm; tomorrow there is a drop-in session from 9.30am to midday. The exhibition is at the Master Shipwright's House on Watergate Street (a wonderful historic building in its own right). The Guardian has the lovely story of a Christmas pudding found at the back of a kitchen cupboard - 111 years after it was sent to a sailor fighting in the Boer War. Philanthropist Agnes Weston was responsible for sending the pudding and other gifts to cheer up those at the front; the tin even bears the message 'For the Naval Brigade, In the Front, With Miss Weston's Best Christmas & New Year, 1900, Wishes.' However, her temperance principles meant that the Peak Freen plum pudding, although full of 'high class ingredients', was alcohol-free. Despite tantalising us with its instructions - 'This pudding is ready for use but may be boiled for an hour if required hot' - the dessert is long past its use-by date and its tin is corroded. 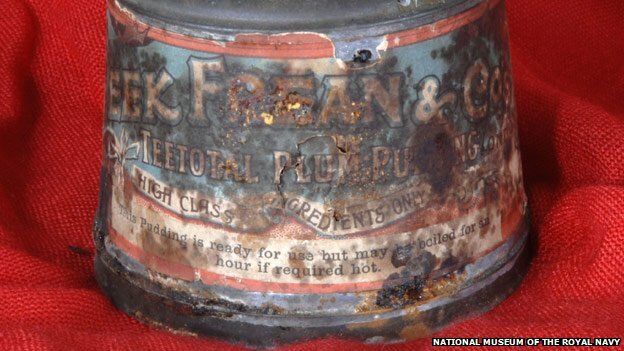 It won't be part of anyone's festive meal, then, but will go on display at Portsmouth's Royal Navy Museum. The Christmas puddings were not the only way in which Agnes Weston brightened up sailors' lives. She founded Sailors' Rest temperance hostels where sailors could get food, drink, baths, (non-alcoholic) entertainment and a bed for the night - from 1892, they were Royal Sailors' Rests. She also published a monthly letter which was sent to sailors at sea, developing into the journal Ashore and Afloat, and campaigned for widows' pensions. In recognition of her philanthropic work, she was buried with full naval honours in 1918. Although the services it provides has changed, her organisation (now RSR) continues its work today. 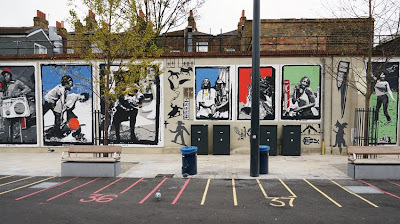 Replacing the earlier Deptford Railway Yard, this mural was painted during Deptford X. Peter Anderson scaled up his photographs (taken in Deptford and, er, New York); between them are 'posterized photograms of playful icons and objects that [he has] collected from Deptford Market'. 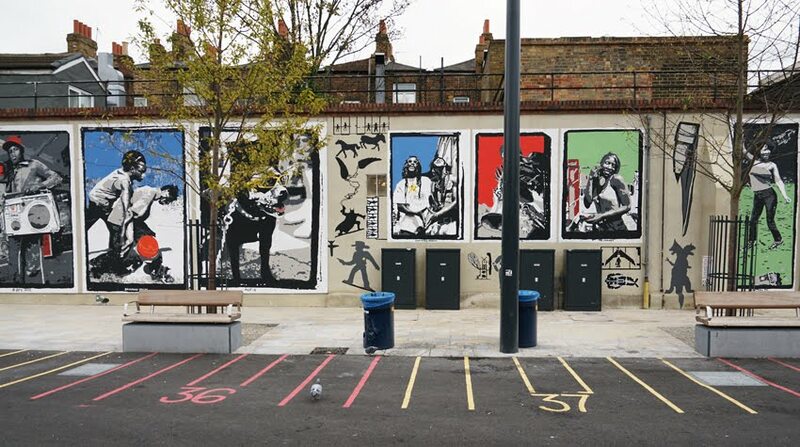 They are intended to 'represent the urban culture of the Deptford community'. Reader, I'll leave you to judge for yourself.